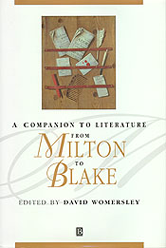 This definitive Companion provides a critical overview of literary culture in the period from John Milton to William Blake. Its broad chronological range responds to recent reshapings of the canon and identifies new directions of study. The Companion is composed of over fifty contributions from leading scholars in the field, its essays offer students a comprehensive and accessible survey of the field from a wide range of perspectives. It also, however, gives researchers and faculty the opportunity to update their acquaintance with new critical and scholarly work. The volume meets the needs of an intellectual world increasingly given over to inter-disciplinary and multi-disciplinary study by covering philosophical, political, cultural and historical writing, as well as literary writing. Unlike other similar volumes, the main body of the Companion consists of readings of individual texts, both those commonly and less commonly studied.